Piano Sonata No. 3 in C, Op. 2 No. 3 (1794/5) [26:35]. 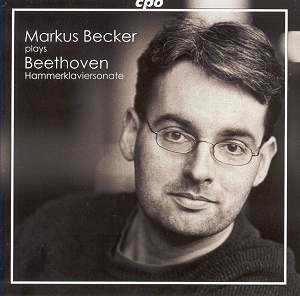 I very much enjoyed Markus Becker's disc of Dussek for CPO on 777 020-2 (see review): piano sonatas Opp. 44, 61 and 64. Yet Dussek is one thing; the Beethoven of the Hammerklavier altogether another. Becker clearly takes a heroic view of this gargantuan work; just listen to the challenge of the opening bars. There is plenty of understanding of voice-leading here, too. It is just that there is a tendency for Becker to get more pedestrian as the movement progresses. The Scherzo fares well enough, but it is not really until the huge slow movement that we get to hear what Becker is capable of. Becker takes it at my kind of speed: very, very slowly – it takes him just one second under twenty minutes. He has the long-range clarity of thought and the cantabile, legato touch to sustain it. If this is not the deepest version - try Schnabel, Pollini or Brendel for that - Becker nevertheless sustains the tension over such a large span. A shame, then, that the finale almost spoils it by being rather careful with the fugue's expository semiquavers. In live performance I feel sure Becker would not tread quite so thoughtfully. The tension does flag, though – this is more Bachian than Beethovenian playing. Ironically, Becker is at his best just before the end. There is so much to admire here, yet this is clearly an interpretation in progress. The B flat Sonata, Op. 22 is one of the longest of Beethoven's earlier works in this genre. It is also notoriously tricky: that pesky C major – so many white notes! Yet Becker makes light of the difficulties, clarifying voice-leading and projecting a crystal-clean treble. This is very well caught in CPO's recording. The dreamy yet not unstylish Adagio is pitted against an opera buffa-like Scherzo where the polyphonic strands play Tom-and-Jerry with each other. The finger-twister finale is expertly negotiated with a real sense of rightness. Becker is a pianist to watch. I would like to see him live, for sure. Unfortunately the booklet is not up to CPO's normally high standards. There is no recording venue specified, something CPO are normally consistent about – also, his instrument is referred to as a 'fortepiano' and – just next to that – a Steinway model 'D'.